When Mansion Casino opened back in 2003, it only had games from Playtech, but today this casino also have titles from IGT. You can play slots, table games, video poker, single-player keno, single-player bingo, and various scratch card games here. Mansion Casino is available in English and German. The casino accepts deposits in several different currencies, and you can even deposit bitcoins into your casino account. However, you can not withdraw bitcoins. Mansion Casino holds two gambling licenses: one from the UK Gambling Commission and one from the Gibraltar Gambling Commissioner. The slot section at Mansion Casino is home to over 150 different slot machines from Playtech and IGT. The Batman slots with progressive jackpot, such as Batman & Catwoman Cash, Batman & Mr. Freeze Fortune, Batman & the Batgirl Bonanza, Batman & the Joker Jewels, Batman & the Penguin Prize, Batman V Superman Dawn of Justice, and Batman vs Riddler. A majority of the table games in the live casino are roulette, blackjack or baccarat, but you can also find some other card games here, including casino poker games. Mansion Casino have roughly two dozen scratch card games from Playtech. The Mansion Casino app for iOS is found in Apple’s App Store. The Mansion Caisno app for Android is found in the Google Play store. You can also access Mansion Casino directly through the internet browser on your mobile device. Some of the games are not adapted for touchscreens. 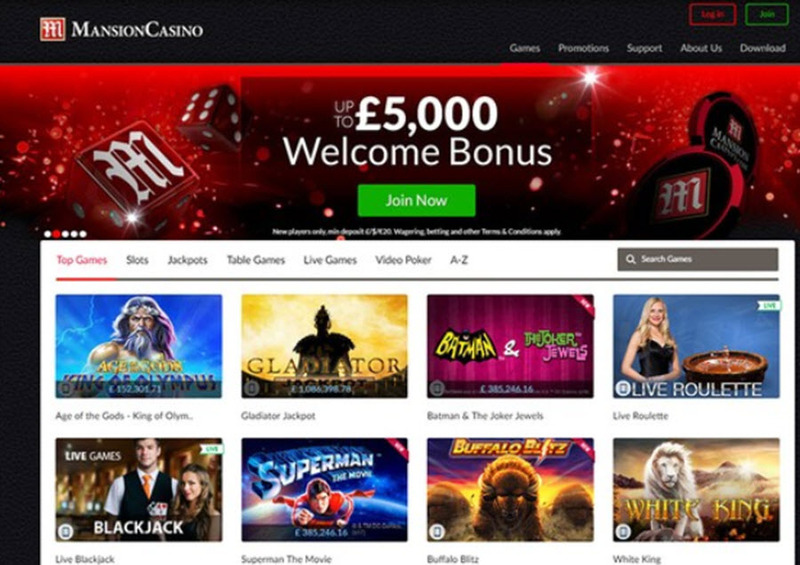 You have a huge list of methods to chose from when you want to make a deposit to Mansion Casino. For all the methods listed below, the processing is instant and the casino will not charge you any deposit fee. You have to use the same method for the withdrawal as for the deposit. Exception: If your deposit method is not available for withdrawals. For the methods listed below, Mansion Casino does not charge any withdrawal fee. If you want the standard maximum withdrawal amount raised, contact the customer support because they might be willing and able to help you. They can increase the limit in some cases, e.g. for VIP players. Bitcoin (BTC) – you can deposit in Bitcoin, but not withdraw. The customer support is staffed 24/7.